Let the grilling season (kind of) begin!!! We finally cracked above freezing around here (isn’t it amazing how good 35°F and sunny can feel?) and had to celebrate with the first grilled chicken of the year. Clean and rinse the chicken and pat dry. To cut down the cooking time, butterfly (spatchcock) the bird by setting the bird in front of you, breast side down, and cutting up through the backbone with either a pair of kitchen shears or a sharp chef’s knife. Now spread the bird open like a book and locate the keel bone that sits between the breasts. Nick it with a knife to get it to open up, but don’t cut all the way through. Flip the bird over and press down on the center of the bird until it lies pretty flat. Rub both sides of the bird with the rub, working it under the skin a bit. Set the bird skin side up and give it a good dusting of salt. Arrange chicken skin side up on a pan (I use a large jelly roll pan) and stash in the fridge, uncovered, for at least an hour. This not only lets the rub and the salt do their thing, but also helps dry out the skin so it stays crispy. Set your grill up for an indirect cook at medium-high (400°F) heat. I used the plate setter with its legs up and my new monster drip pan to diffuse the heat and create a more convective cooking set up. I filled the drip pan with a couple of cups of water to keep the drippings from burning. 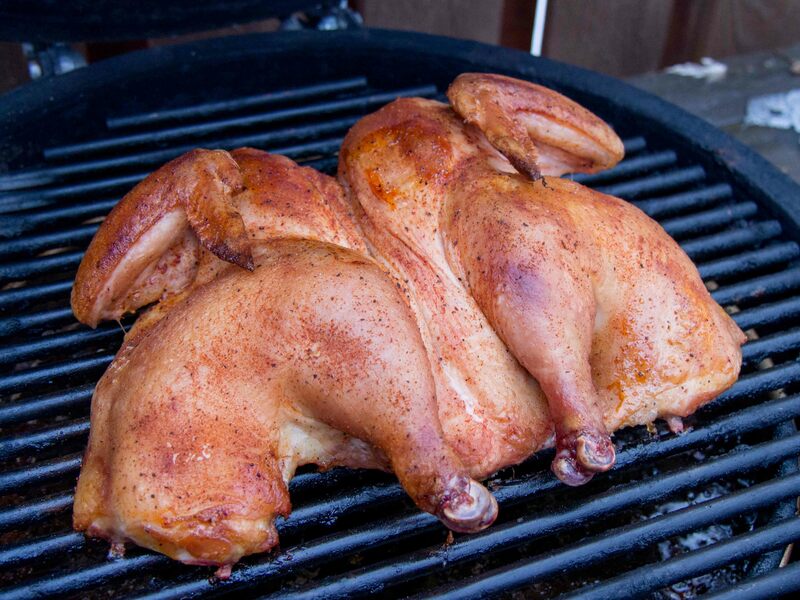 When your grill is up to temp, arrange the chicken on the grate skin side up. Close the lid and walk away – no poking, no flipping, no peeking (ok, maybe just a little peek to make sure everything is cooking evenly) for 60 minutes, or until the chicken is done – 180°F internal in the thickest part of the thigh and/or the leg joint moves easily and the juices run clear. This chicken was a tasty way to kick off the grilling season, but in a way, it’s also the start of my larger search for the perfect grilled chicken – smoky, crispy, moist, and tender. Anyway, more on my chicken odyssey as the year unfolds. Wish me luck! Wow, that is a monster drip pan. You only have to dump it once every 3-4 months, ha ha! Great looking bird. Previous Previous post: St. Paddy’s Pastrami?! ?